I was recently given a voucher to go and buy some of the new relaunched Fruche, and hold a small morning tea so that some friends and I could try it out. I am under the impression that Fruche is launching quite a few new and improved flavours, but my local supermarket only had a limited range, so I picked the three that they had: Vanilla Bean, Strawberry Fields and Tropical Mango. I was interested to see that they are really highlighting the link to Yoplait, with all of their new packaging having the tagline “Inspired by Yoplait”. 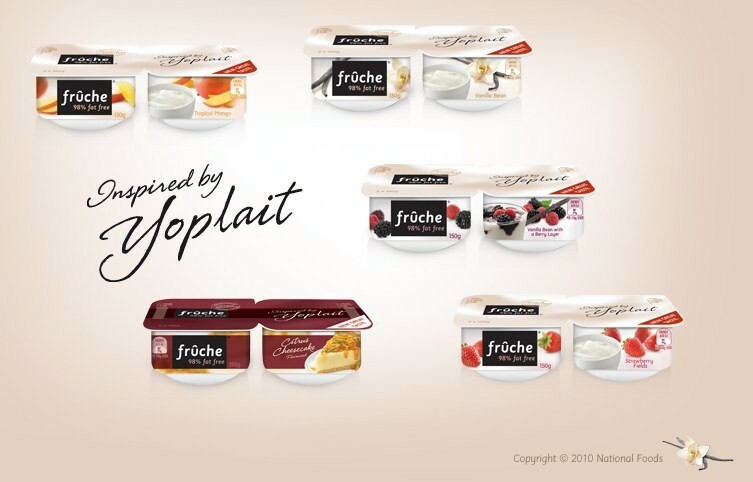 I found this a bit ironic, since I often buy Fruche, but I rarely buy Yoplait yoghurt (when I do buy yoghurt, since I mostly make my own! ), preferring Mundella which does not have any thickeners, gelatine, or added preservatives. I have eaten Fruche for a long time, finding it a quick and easy healthy snack that usually satisfied me when I was craving something creamy and sweet, since it was much less “yoghurty” than yoghurt. I also used it quite often as a base for low fat dessert recipes. Mix Fruche and ginger and leave to sit in fridge for about 10 minutes. Mix orange juice, apples and pears, and place into 4 serving bowls. Top with gingered Fruche and serve immediately. Puree strawberries, agave nectar and lemon juice until smooth. Sprinkle gelatine over 2 tbs boiling water and stir until completely dissolved. Allow to cool slightly, and then stir quickly into strawberry puree. Add Fruche and stir to combine. Spoon into 4 serving dishes and refrigerate until set, a few hours. Garnish with extra strawberries and mint leaves if desired. Disclaimer: I was provided with a voucher for the Fruche. All recipes and opinions are my own.